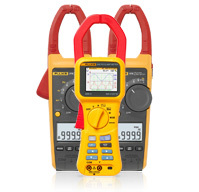 Clamp-style multimeter lets you make instant tests and measurements without disconnecting wires. Use this clamp-on multimeter to test amperage up to 2500A. The digital multimeter features an easy-to-read LCD display and an automatic zero adjust for precise and accurate measurements. Also check our Current Probes!